After a wonderful third season, Harbour Sundays is back for 2019 for your perfect Sunday night local music fix at one of Perth’s most picturesque venues. 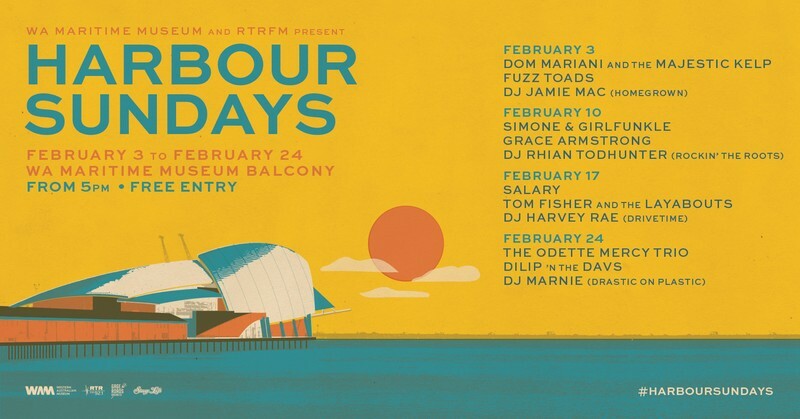 Join us on the Museum’s balcony at Victoria Quay for four weeks throughout February for local music, DJs, drinks and the best spot in Perth to watch the sun go down. The 2019 season kicks off on Sunday February 3 with psyche rock styling’s of Fuzz Toads, alongside the legendary sounds of Dom Mariani and The Majestic Kelp, plus DJ Jamie Mac of Homegrown. On Sunday February 10, we are blessed with the talents of singer songwriter Grace Armstrong and the majestic harmonies of Simone & Girlfunkle. Joining them will be one Rockin’ The Roots’ DJ, Rhian Todhunter. Sunday February 17 sees us go just a little country with the drawling sounds of Tom Fisher and The Layabouts, with the big band magic of Fremantle troubadours, Salary. Joined by DJ Harvey Rae from Thursday’s Drivetime. And to close out the 2019 series, on Sunday February 24 we get funky and rootsy with the sounds of Dilip n The Davs before the best voice in the west closes things out with the soul wonder that is Odette Mercy playing in trio form. Plus DJ Marnie Richardson from Drastic on Plastic will let you party till the sun sets. Harbour Sundays is the perfect way to spend a summer by the Indian Ocean, with stunning ocean views at an iconic Fremantle landmark and some of the city’s finest local musicians. Plus with beer and cider from the team at Gage Roads Brewing Co., there is no excuse not to spend your Sunday within the heart of Fremantle Quay.